This guide is about your daily life, and the technologies you come into contact with. Okay, so maybe not your whole day, because technology companies don’t need to know what you had for breakfast. By starting out with a ‘diary’ mindset, our aim is to help you document problematic encounters with technology. Some technologies are designed well and work well for you as a person with a disability, but other technologies may be designed in such a way that they sort of work for you, but not very well. Or, certain technologies may be completely unusable by you, in which case you either have to get help from a friend or a willing stranger, or you simply avoid using those technologies altogether. For many years, people with disabilities relied on ‘alternative’ products that were designed specifically for their needs. These days, there are more and more mainstream technologies that are designed to work for the wider population, including people with disabilities. Websites, ATMs, ticket machines, phones, home entertainment systems: all these types of mainstream technologies can be made to be accessible to people with a wide range of abilities. While the interaction for people with disabilities may not be exactly the same as that for people without disabilities, it can be and should be equitable. Why document the things that you have difficulty operating or cannot operate because of the way they are designed? To bring about change. Change for you, and change for other consumers who have disabilities similar to yours, and change for all consumers. It’s your life and you get to choose what you want to be a consumer of. You may decide you don’t want cable TV because you can get all your entertainment needs over the web. That’s a choice. But, if you can’t use cable TV because you are blind and the on-screen menus and guides don’t speak, that’s not a choice. People with disabilities can be precluded from making choices because of a lack of accommodation in design. You’re already purchased Product X because it was advertised as being accessible, but the accessibility solutions that they employ in the design are so cumbersome or frustrating that they aren’t practically usable. Product X could be a technology intended to be used in your home, your office, or it is located in public (e.g., ATMs, ticket machines, and vending machines). Either way, ‘consumer demand’ comes from consumers. If you encounter things that are inaccessible, someone has to make the demand for access. This guide is intended to help you describe your issues and then make contact with companies so that they know what your needs are as a consumer. It may turn out that the company has never heard of or thought of accessibility as an issue before. This may be true of some small businesses and startups, but should be less the case with big corporations. It may be that the company thought they had accessibility solutions in place, but were unaware that a particular problem was being experienced by customers with disabilities. Or the company may be quite unaware that some people want to use their products but can’t. The burden isn’t on you the consumer to solve the problems of technology manufacturers and service providers. That’s their responsibility. But, part of the burden is on consumers to bring up issues and raise awareness of problems that need solving. This guide is intended to help you interact with companies as a consumer. There may be a need to escalate your issue to societies and organizations of and for people with disabilities that can petition on your behalf, and we discuss that near the end of the step by step guide. In order to come up with solutions to a problem, we first need to define two things: (1) what is happening now; and (2) what we want to be happening. It is important to use the collective term ‘we’, because it isn’t just the consumer’s wants and needs, it is also the company’s wants and needs. Negotiation is required to end up in a place where both the consumer and the company share an understanding of each other’s wants and needs, and come up with a proposed solution that is mutually acceptable. Most dissatisfied users simply stop using something rather than putting in the effort required to make a complaint. Those who abandon cable TV may have chosen to get their entertainment needs met elsewhere. The way they regard it, why should they continue a dissatisfying relationship with the cable company? If the dissatisfied user decides to let the cable company know why they made their choice, then the company should regard this message as a ‘gift’ to them. The company’s alternative option is to obtain no feedback at all while the customer base declines. Smart companies view formal complaints and informal reviews as vital feedback to help them improve their customer experience. But do you, personally, want to be seen as the complainer? Do you aspire to be that person with the ‘grumpy’ reputation? If we actually complained about everything we could complain about, it could be a full time job. For most of us it isn’t our first choice, but then change has to come from somewhere. Could your complaint help not just you, but thousands of other people in similar circumstances? It’s up to you whether you want to give the gift of feedback, of questions, and perhaps formal complaints. Change the user settings / options / preferences. Investing a little time here can save you a lot of your time if the subsequent steps aren’t actually necessary. The next thing to do is establish something with which to compare your own experience. What is it that other (nondisabled) people can do that you can’t do? In your description, think about whether people are expected to be able to use this product independently or with the assistance of other people, or a combination of both? One example is the payment machine at the end of a supermarket checkout. It is used by both the clerk and the customer, but a certain part of the transaction is expected to be carried out independently by the customer (selecting credit or debit, verifying the amount spent, and signing). Another example is a self-checkout machine in a supermarket, where the customer is expected to conduct the whole process independently, and assistance by the clerk is given only when transaction problems arise (an incorrect price shows after scanning a cereal box). Day-to-day operations. Using the product for the purpose it was designed for. For example, if it’s a multifunction printer, selecting choices from the on-screen print menu, scanning documents, retrieving printed pages. Periodic operations. Things that happen only once in a while. For example, refilling the paper tray. Fixing a paper jam. Regular maintenance. Things that happen very seldom. For example, changing the ink cartridges. First time installation. Things that only happen once. For example , unpacking the printer, putting the components together after shipping, reading the manual. Repair and service. Consumer repair (e.g., reinstallation of faulty or outdated software drivers). Also, things that are not expected to be done by the consumer (e.g., taking the printer apart to replace a broken component). The list goes in order of importance. In general, for personal technology products, day-to-day and periodic operations are more important to do independently, whereas regular maintenance, installation and repair may require the help of others (e.g., the cable guy installs a new set top box). Note: For public use technologies, day-to-day operations are only done by the public (e.g., using the self-checkout system independently). In addition, try to be specific in your functional description. The term ‘unable to see’ can have many different functional meanings, from not being able to see at all, to being able to make out light and dark, to being able to see with the aid of powerful magnification. The problem is defined as the difference between what is (or is not) happening, and what you want to be happening. This should be described with reference to what other people are reasonably expected to do (Step 2, above) and the functional limitations you have (Step 3, above). “The clerk asks customers to swipe their card and follow the on-screen prompts to check out. “I have no vision at all. I can only perceive when the environment is light or dark. Note: If you are using any assistive technology as part of your interaction with either public or personal technologies, make sure to note the type of technology, any version number, and any pertinent settings. The most common first step of contacting customer support is via the company’s website. In addition to marketing campaign slogans (“We are the number one seller of widget gizmos!”) their website may also have an accessibility statement (“We strive to make our website accessible, treat all customers fairly, and we endeavor to make widget gizmos that are as accessible as possible”). If there is such an accessibility statement, it is usually found with the links at the bottom of a company page, alongside legal notices and ‘Contact Us’ links. A statement is useful to know about before contacting customer support, because this represents the commitment the company is making publicly. An absence of a statement might indicate that the process may take more time. Some companies may also describe or provide a link to their accessibility team. Usually the accessibility team is an internal service and support group that helps other groups in the company with any accessibility related matters. Our advice is to take note of the existence of any such team, but contact customer service first unless the website provides a different suggestion. While it may be tempting to try to go to the accessibility team first, usually that team supports internal company employees (including those in the customer service team), and you are a customer not an employee. With the problem description that you have from Step 4, above, contact customer support via an online contact form, online chat, or telephone call. Make it clear that you want help to resolve a problem, and describe what the problem is. In any interaction with customer support, what you really want from them is a commitment to working on the problem, a timeline to get back to you, as well as contact names. You should also make your own notes on the dates and times of contacts, the numbers you called, and names of the people you contacted. They have no idea what you are talking about: Try to reiterate the problem, and then if that fails, ask if they can put you through to someone who might be more familiar with this particular technology issue. They suggest that you get help from others: Reiterate that you have the same desire as other customers, to be able to use products independently. Ask them how they, personally, would feel. Ask them what they would do if they were in your shoes. They believe there is no solution: Remind them that there are always solutions to consider, and that other similar examples of accessible technology already exist. They are condescending or otherwise rude: This is most likely the result of insufficient or nonexistent training, and is an indicator that the company does not take accessibility seriously. Try not to get angry back at them for their ignorance. Don’t get mad, do try to seek resolutions. They offer to “look into it and get back to you”: Your first instinct may be to say “wow!” but your second instinct may be to say “wait a minute, I’ve heard that one before!”. In this instance, it may be best to give them the opportunity, and if they follow up that’s great. If they don’t and you’ve heard the same thing three times already from different staff, it may be time to escalate (see below). They tell you that your only option is to file a written complaint: This is often the go-to option for customer support staff who don’t know how to handle a given issue. You may suggest to them that making a written complaint is not your wish, and that instead you would prefer to speak with someone directly who might be able to understand and act on the problem. If your only recourse is to file a complaint, then do so and wait a reasonable amount of time for a satisfactory response before escalating. If the complaint process or form to fill in is inaccessible or burdensome, escalate straight away. When seeking assistance, if your disability and/or any assistive technology you use with your computer means that it takes you longer to do things, then it is helpful to ask the person you are talking to for extra time to get to where they are telling you to go. At times you may also find yourself having to explain to customer support representatives that you are navigating a website using a AT (a screen reader, for example). You may have to explaining what a screen reader actually does, and ask for them to remain patient while you use your AT (e.g., to use the screen reader to speak the page contents, where you can hear the speech but the person helping you can’t). Some support representatives may be wowed, but others may be totally perplexed if they are untrained. Some organizations offer to do remote takeovers where they operate your computer for you, because it is quicker for them than explaining how to do something. For sighted users, following along with the customer service representative’s actions might be straightforward. However, if your system is set to use AT, you may have to turn off your AT to allow such interactions to take place (they won’t know how to use a screen reader, for example). If this is the case they will need to take more care explaining what they are doing and may easily trip up (e.g., “you see this little button over here where I’m pointing the mouse… oh, wait!”). Repetition of statements for clarification may be needed. Patience may be required on both sides. Experience shows that in many cases, you will have to escalate. Customer service in many mainstream technology companies is not equipped to understand or help with accessibility questions. Nevertheless, you will need to have done your due diligence in contacting customer support to begin with. Customer service may try to escalate you to a manager or supervisor of customer service first, but they may have the same issue in terms of a lack of direct experience with disability access. If there is an accessibility team, ask to be contacted by them. They should know the people within the company who can help resolve the issue. But, they may not know. It is often the case that sales and customer support representatives are not fully aware of accessibility services that are available within their own organization. A simple solution might be to point them back to their own accessibility statement if there is one. With the accessibility team, be prepared to discuss the issues you are having in more detail. They should not need reminding of any public commitments to accessibility made by the company. The same goal applies as before: to get a commitment to working on the problem, a timeline to get back to you, as well as contact names. If there is no commitment from the accessibility, as a final gesture of escalation, ask for a message or contact from their CEO to explain to you why they are refusing to make their technology accessible. If Step 6 failed and you didn’t get a satisfactory resolution to your problem, the next step is contact other experts who might be able to help. Usually the best starting point will be an organization for and of people with disabilities. For example, if you are in the US and are blind or have low vision, you could contact the National Federation of the Blind. In addition, there are subject matter experts such as accessibility consultants and other professionals who may be able to give you some free advice on technology issues, and how to go about getting a resolution to your problem(s). For more in-depth attention to your problems they may seek a fee, or they may advise you to consider legal action. If experts cannot help in resolving your problem, you may be advised to seek recourse through means of legal actions. Most people will advise that this should be the choice of absolute last resort, because it involves committing yourself to a process that may prove taxing, arduous, and expensive. Even though it is the last resort, sometimes it is the only course of action left open. But if you don’t stand up for your rights, then who will? In the title of this guide, we said “demonstrating the level of accessibility of the technologies you interact with, and those you cannot interact with”. While we have concentrated in this guide on the problematic interactions, there are certainly a lot of companies who have invested in accessibility solutions to make their information and communication technologies inclusive. Companies that have done this would no doubt appreciate positive feedback to know that their efforts are paying off. We mentioned that small businesses and startups may be unfamiliar with accessibility at first. We made a guide for small businesses and startups. We also mentioned that large companies should know about accessibility issues in general, but they may be unaware of a particular issue, or they may focus on accessibility in one or more areas of their business, but they omit dealing with accessibility in another business area. For taking an organization-wide approach, we made a Roadmap guide for vendors. A Complaint is a Gift: Recovering Customer Loyalty When Things Go Wrong is a book by Barlow and Møller. This book is not specifically about accessibility; it is about complaints in general and what companies should do to embrace and act on complaints. It is a good in-depth read on the subject for both consumers and customer support personnel. Note: for something shorter, there are also plenty of short online articles providing advice on “how to complain”. 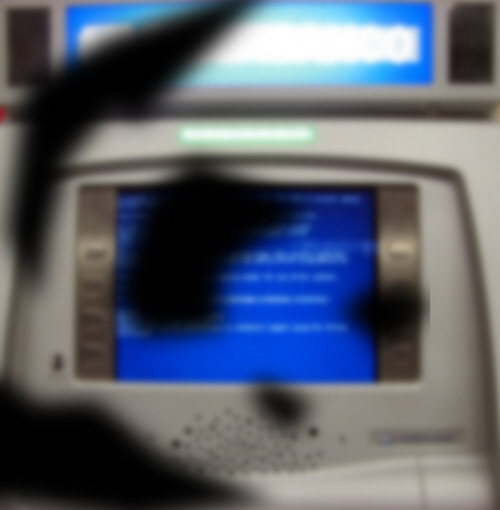 ‘A Portuguese ATM running (or not) windows, in the Lisbon Airport’ by Hashashin, Alberto. CC-BY-SA-2.0. Modified from original.